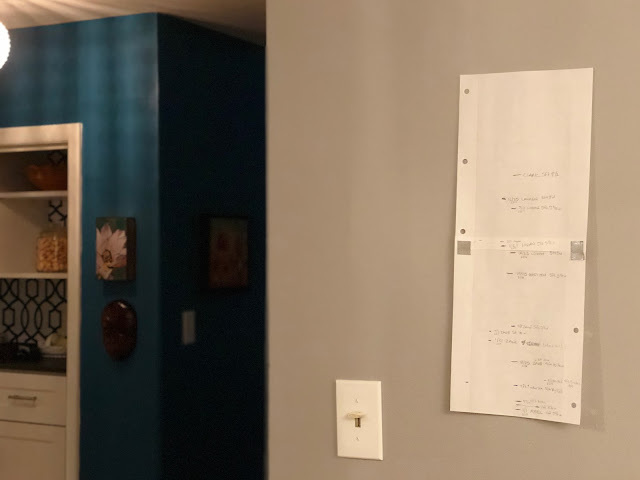 On the wall in our kitchen hangs one of the most important pieces of paper in our family. It's not a birth certificate or a marriage license or a degree of any kind. It's hung by duct tape in a haphazard way. Completely out of place in our organized, tidy, everything matches or coordinates (in the same color palette) decorating scheme. It's physical form is two lined sheets of notebook paper taped together with scotch tape and then hung on the wall using duct tape. It's been there almost a year in that same spot where it was originally hung. It documents the boys' heights. Their physical growth. But there is so much symbolism in those two sheets of paper taped to the wall. Not everything can be controlled. I love those two sheets of paper and if the house was on fire it would be one of the things I grab as I run out. It documents growth, physically, of course but it also documents where our family has been over the course of this very trying year. It has M's height, the child we were intending to adopt on the day he arrived and the week that he left. It has my height, 5 foot 3inches, and I can remember the smile on L's face as he celebrated being taller than me. It has my wife Lauren's height and you can currently see that L is about to pass her as well. I can still hear the "yes!" uttered from the back of Z's throat when we discovered he was tall enough to finally ride in the front seat. Once the children are finished growing I'm going to frame it and hang it on the wall in a place of honor. It's a snapshot of our lives and I adore it more than the matching pillows and the perfectly aligned books. It's our life and it's messy and slightly off-balance, but I wouldn't have it any other way. What activity brings you JOY?